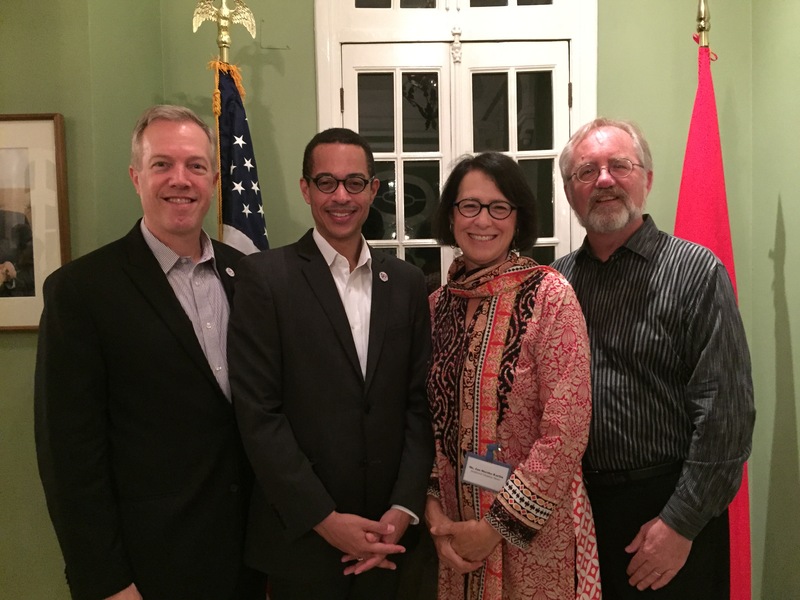 Jan and me with Ambassador Osius and his husband, Clayton Bond. Proud is the operative word to begin my post. I wouldn’t be a musician without the caring guidance of my Uncle Vic. When I was a little boy, we’d listen to Berg’s Wozzeck complete conducted by Mitropoulos because he adored Eileen Farrell, Miles Davis and Modern Jazz Quartet albums, Beethoven symphonies, Tony Bennett, you name it. And in his generation, he was adopted by his partner Ernie so he could inherit property. It was a different world in the 1950s and 60s. 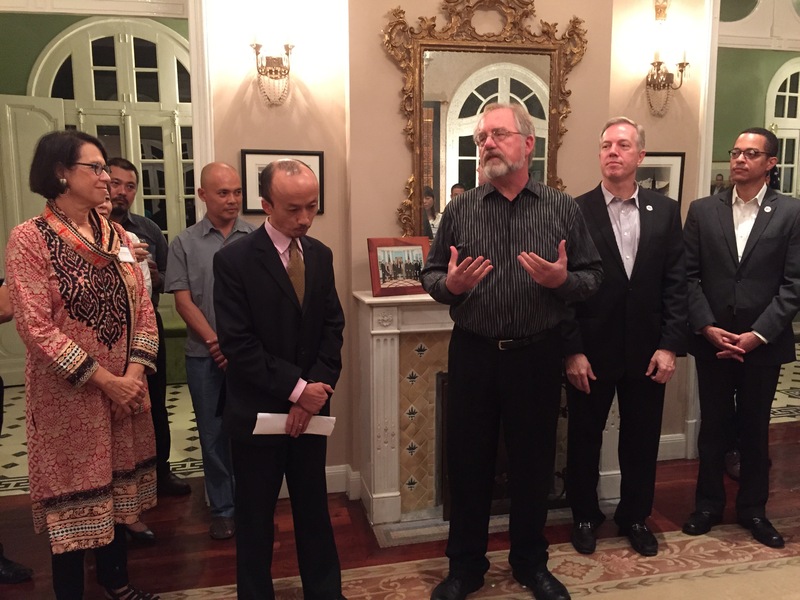 And so it was with extreme pride that Jan and I were hosted by Ambassador Osius and his husband, Clayton Bond, with a reception in our honor at their Hà Nội Residence. And yes, I had to find a quiet moment to wipe away some tears, because I could feel my Uncle’s presence that night. How proud he’d of been, on so many levels. Would you like to talk about American values? Việt Nam, just in case you’ve forgotten, plays a permanent and complicated role in the history of the United States. As nations in Asia realign after a 20th century of wars and revolutions, our role in the region needs a fresh approach. China’s importance is here to stay. Japanese pacification is outdated. How India and China compete with each other is a huge narrative. Myanmar is coming in from the cold. The struggles of Hong Kong and Taipei with Beijing will be closely monitored in the West. 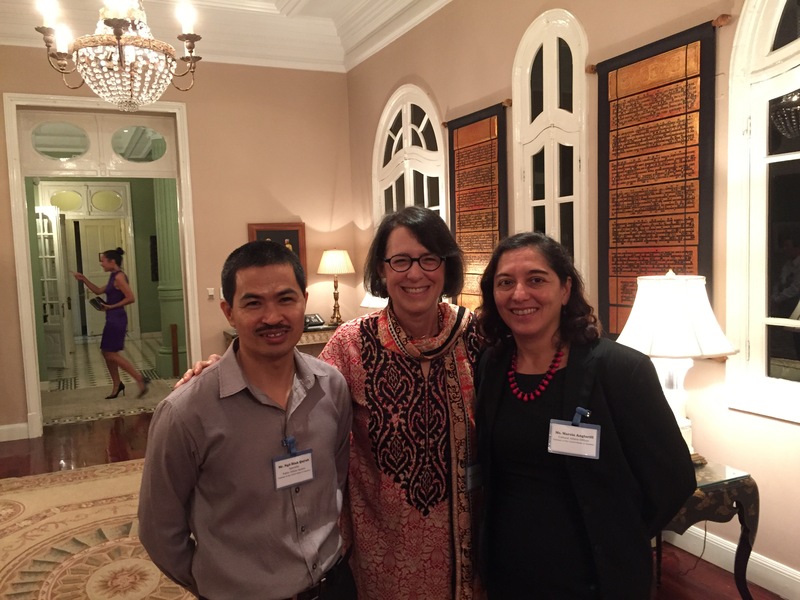 Having been stationed for years in Jakarta, Ambassador Osius knows the stakes of Indonesia from deep experience. President Obama is hosting all heads of state from the ASEAN countries in Palm Springs in February and heading to Laos in September, with a trip in the works to Việt Nam. These are deep waters. And so the ambassadorial appointment of Ted Osius and his husband Clayton Bond, along with their family of two adopted Cuban children, reflects the American values Jan and I hold dear. That we understand the word “all men” to truly include everyone, male and female, gay or straight, inclusive of any ethnicity. The stakes for all of us in Asia are just to high for experimentation with a cosmetic appointment. 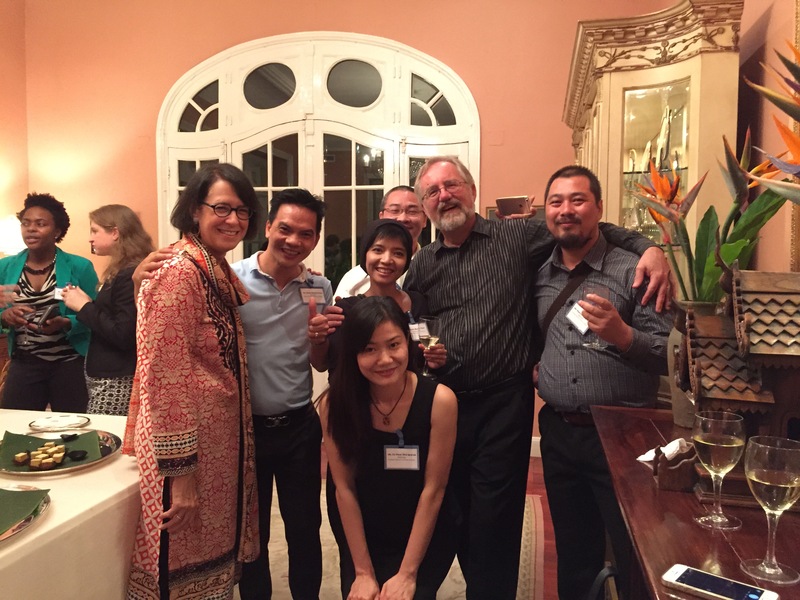 Which brings me to tell you how the Ambassador dug into our appointments as the first official American artistic advisors approved by the Vietnamese government and our roles guiding the Hà Nội New Music Ensemble. 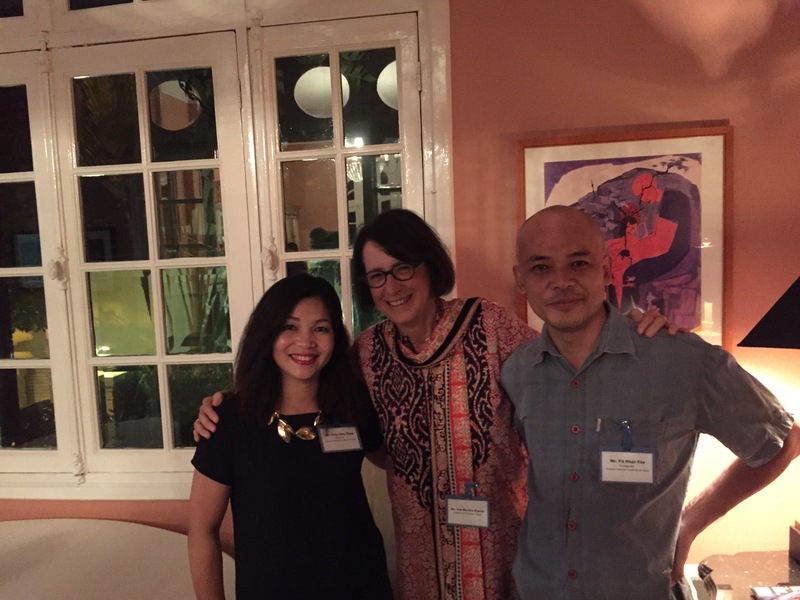 Jan with Embassy staff Quỳnh Ngố and Marcia Anglarill. 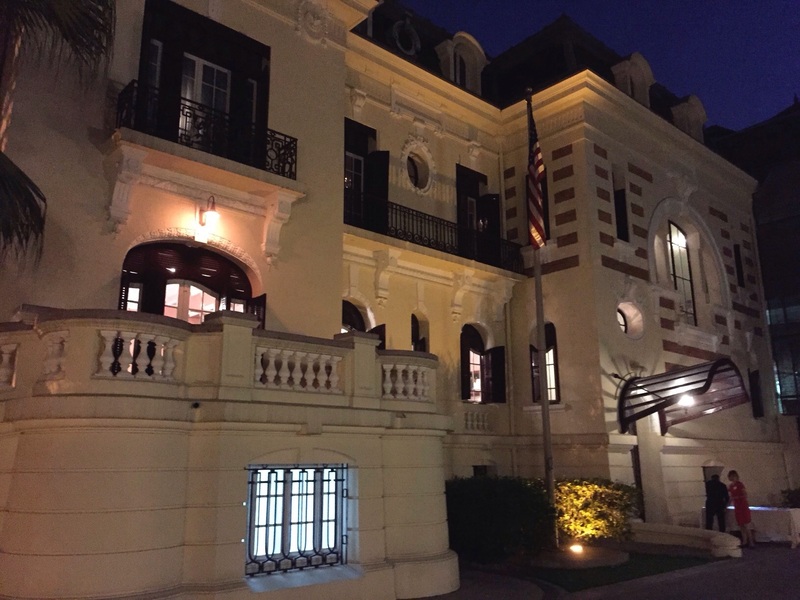 Upon arriving in Hà Nội, our first day included a meeting at the U.S. Embassy to follow-up on various emails that had gone back and forth before we arrived. 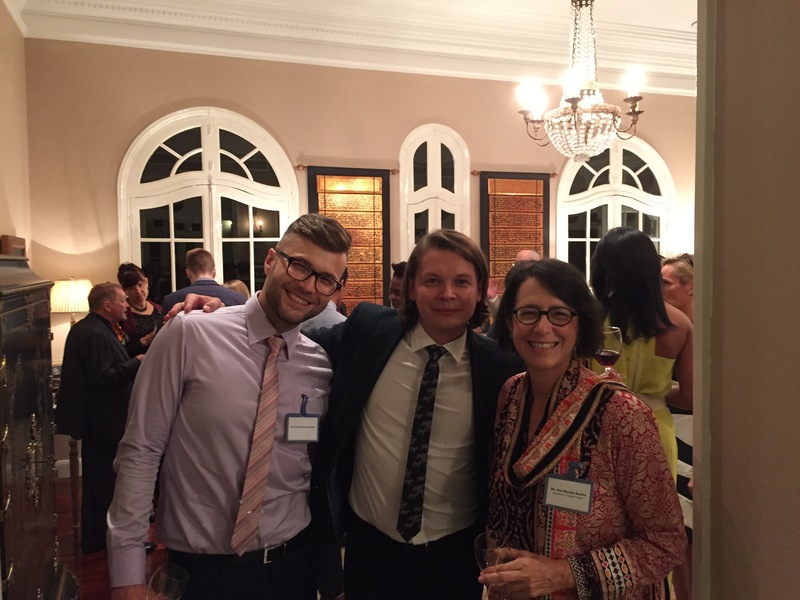 Jan and I have known Quỳnh Ngố for a decade, and he is one of the best and most attentive Embassy staffers imaginable. He seems to read the tea leaves of Việt Nam as well as anyone possibly can. Of Catalan ancestry via South American parents, our Cultural Affairs Officer Marcia Anglarill was also part of our first meeting and set up quite an agenda. Here’s a Fun Fact for any future Embassy meetings you might have. Be prepared to move quickly with a lot of information and get to the point! So in a rapid fire meeting we learned that the Ambassador was all in. We should begin to make arrangements for him to attend the opening concert, which would mean getting Vietnamese permissions for our opening night at the new Old Quarter Cultural Center. Not as easy as it sounds. 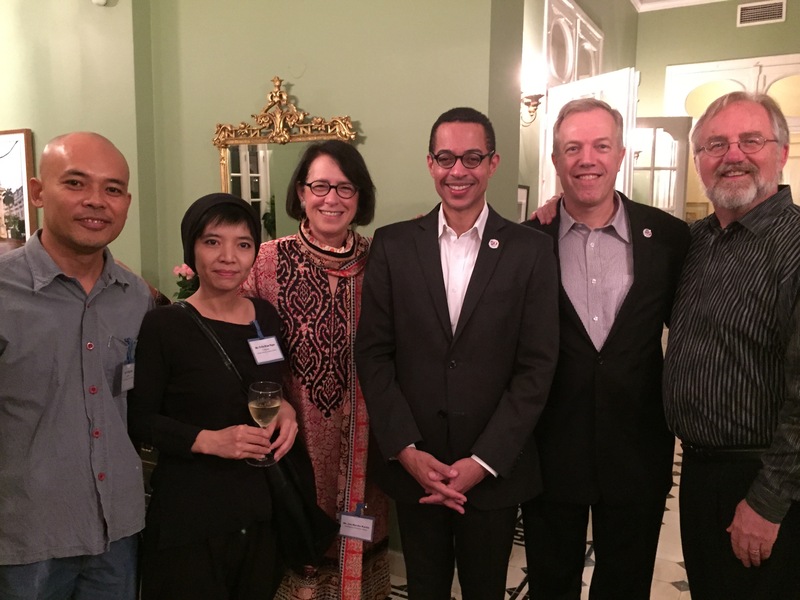 The Embassy would like our appointments to be part of the Daniel Pearl World Music Days, celebrating the roles of Americans and Vietnamese working together through new music to create a fresh historical chapter out of our troubled past. And finally, the Ambassador would be hosting a reception in our honor recognizing our work in Việt Nam for the U.S. State Department, thereby notifying the Vietnamese government and the diplomatic and business community of the full support of the U.S. Embassy to our roles with the Hà Nội New Music Ensemble. They were inviting their entire list, which meant a Who’s Who in Việt Nam, but would need us to help. Check. It was a fast 40 minutes, that’s for sure! 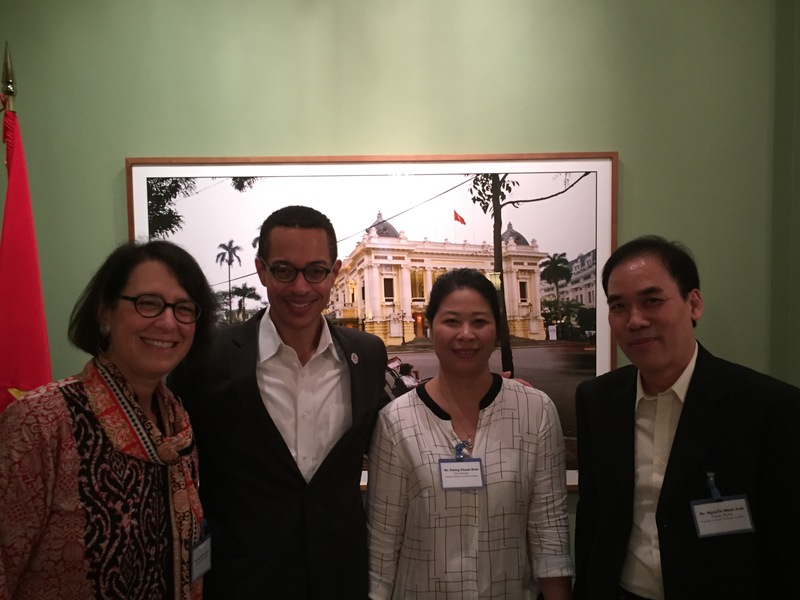 Proud to have Ambassador Osius link our Hà Nội appointments with the Daniel Pearl Foundation. So it’s now history. Before the Hà Nội New Music Ensemble played a note, we were welcomed into existence by the U.S. Ambassador to Việt Nam, Ted Osius. It certainly got everybody’s attention! Ambassador Osius addresses the audience. Vũ Nhật Tân and me welcoming the HNME audience. Notice the Ambassador in the front row right. 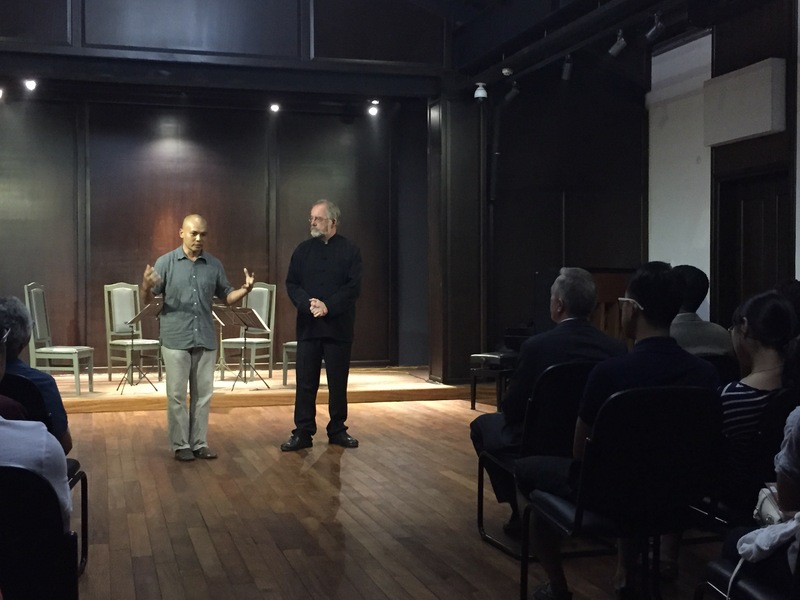 In the sequence of the opening week for the Hà Nội New Music Ensemble we opened at the new Old Cultural Center and continued to our second performance in the 1920s era Manzi Art Space, which you can read about in my two previous posts. With Halloween on the calendar as the night for our last performance, the Embassy and staff would be having a costume party. Wisely, the Ambassador wanted the reception in our honor to be its own event, diplomats do have style! So Friday night October 30 was decided. We could that way “dance all night”, as it were. 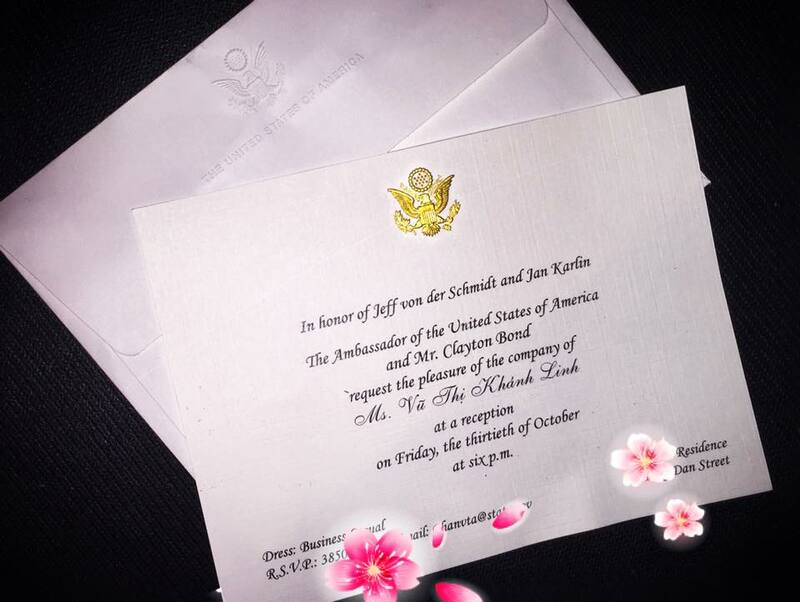 The invitation sent out for October 30, 2015. Jan and I were initially reluctant to take photographs. There are serious security concerns surrounding any U.S. Embassy, anywhere in the world. Somebody, somewhere, is bound to be upset about the United States, so you can appreciate the Vietnamese floral redaction above by my violinist Vũ Khánh Linh. 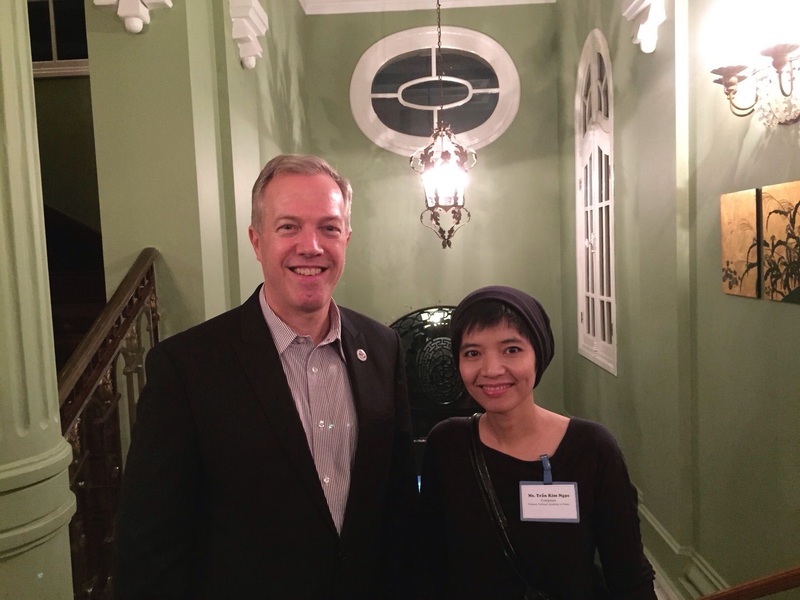 So we asked Ambassador Osius, whose Facebook address is “Hanoi Ted” (yes, it’s a reference to Hanoi Jane if you were curious, but also represents a new era simultaneously) about taking photos and social media posts. 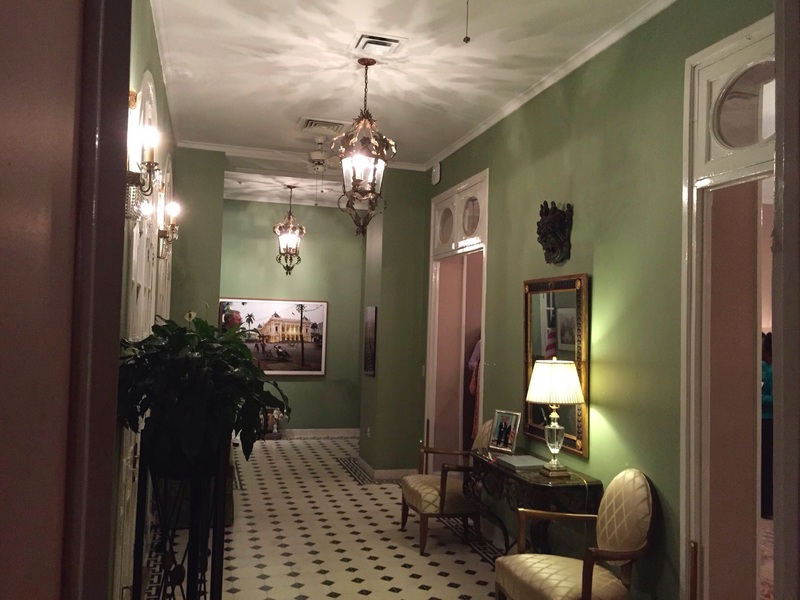 A hallway in the U.S. Ambassador’s Residence. Point taken, and out came the iPhones (thank you Apple in California) and numerous posts ensued. What a treat to have an animated U.S. Ambassador, aware of the impact of his actions on how people would think about America. We discussed his interest in our positions. 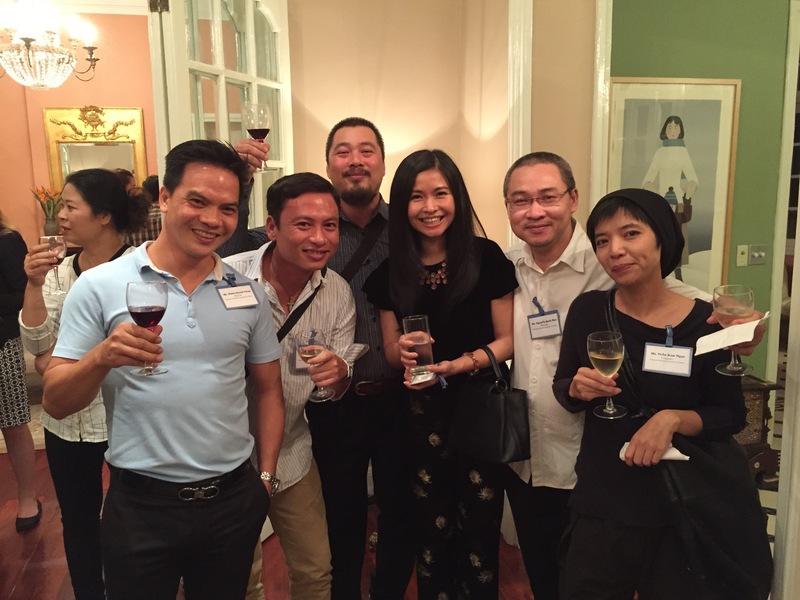 That by encouraging the creative community in Việt Nam with American artists we’d be leading by example, opening doors and finding opportunities with common sense American solutions. A great conversation to have in Hà Nội, Việt Nam, in the shadow of photographs by Catherine Karnow, the daughter of Stanley Karnow, whose history of the Việt Nam War is essential reading. One of many great touches in their residence. 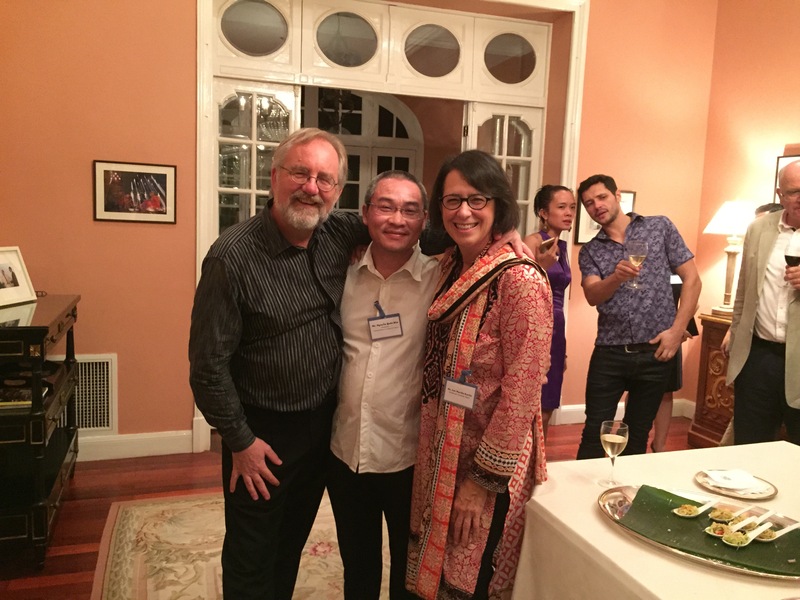 Behind a Karnow photograph, Jan and Clayton with Dương Thanh Bình and Dr. Minh Anh of VNAM. So Ambassador Ted made sure to welcome the composers Trần Kim Ngọc and Vũ Nhật Tân as they arrived at the top of the staircase. And he was certain to include them in his opening remarks and, as I suspected, I’d be speaking after the Ambassador was well. 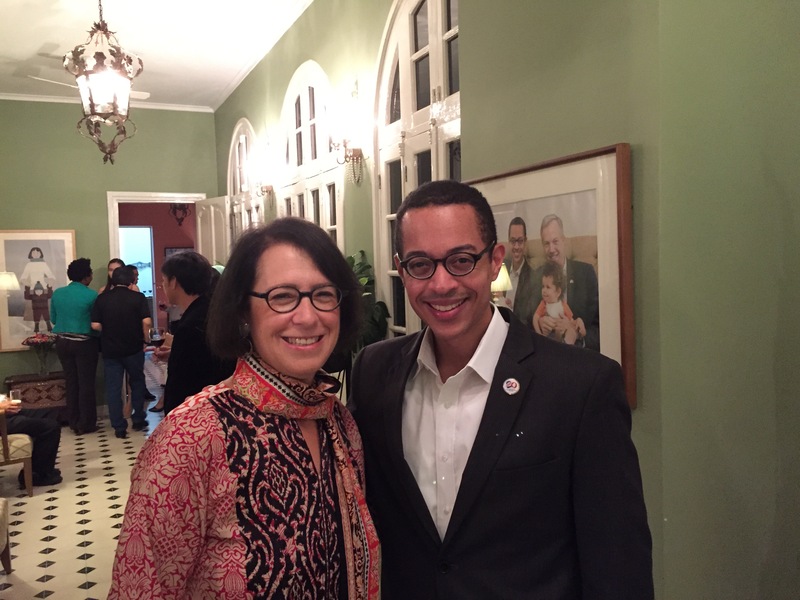 Ambassador Osius with composer Trần Kim Ngọc. 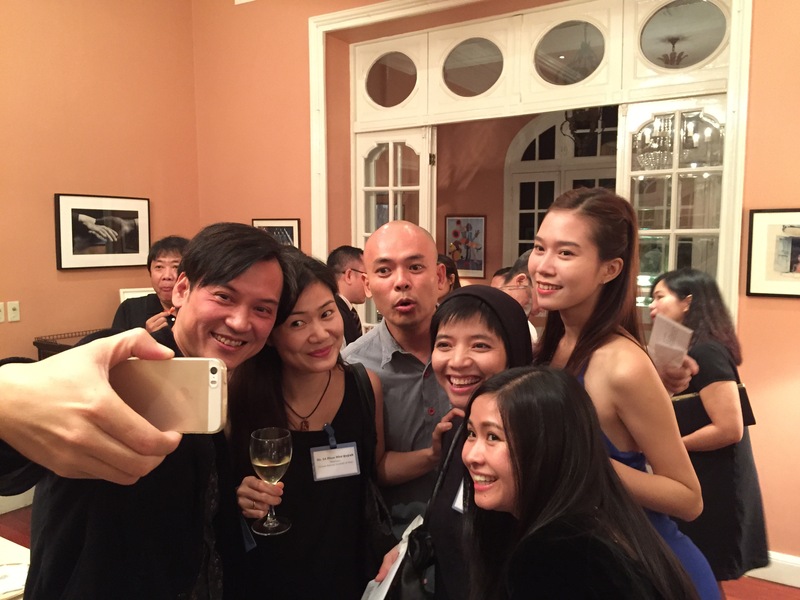 A great American welcome for composers Vũ Nhật Tân and Trần Kim Ngọc. After all the arrivals were accounted for, it was time for Ambassador Osius to greet the crowd. As he’d confided to me during pauses in the meet and greets, I’d be introduced to more ambassadors in one night than perhaps ever before, and if they hadn’t been able to attend, they’d been invited. I should feel free to follow-up with the Embassy list. 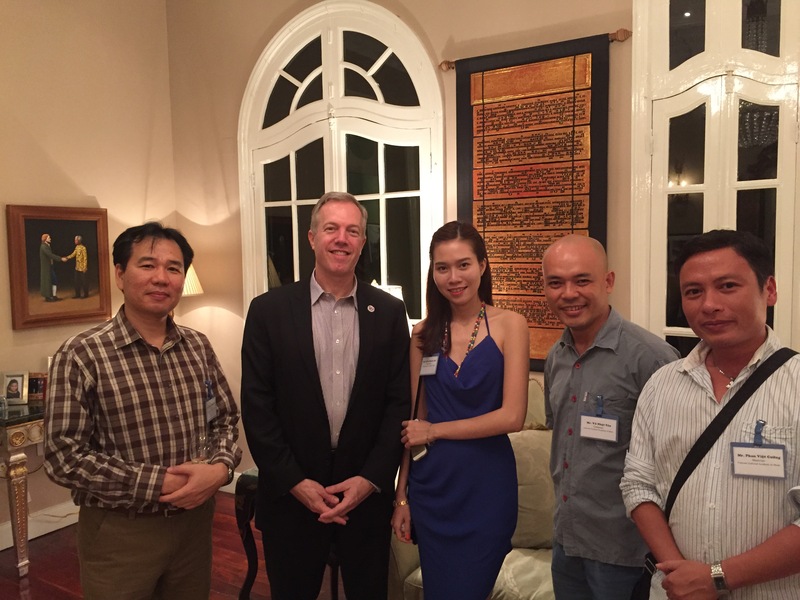 A vigorous endorsement by Ambassador Osius for our roles with the Hà Nội New Music Ensemble. Emphasizing a diplomatic point with my translator by my side. And so, with these centering formalities accomplished, it was time for the party to get into full swing. Not a difficult task in this residence, which was built during the French era and was the house long ago for the tax collector of all of French Indochina. It’s a nice house, that’s for sure! Toasting with California wine, of course! 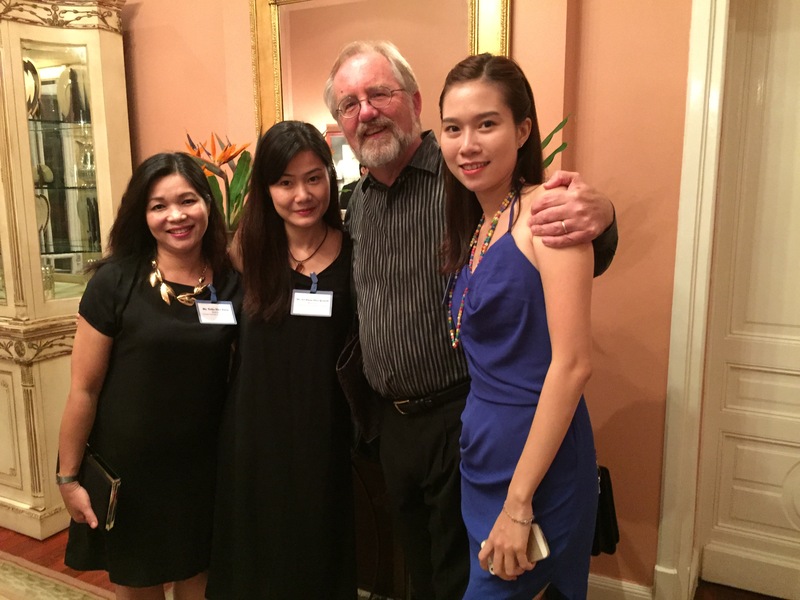 With my Vietnamese tutor Trần Thu Thủy, cellist Lê Phan Quỳnh and violinist Vũ Khánh Linh. Vũ Nhật Tân with Dr. Minh Anh of VNAM. 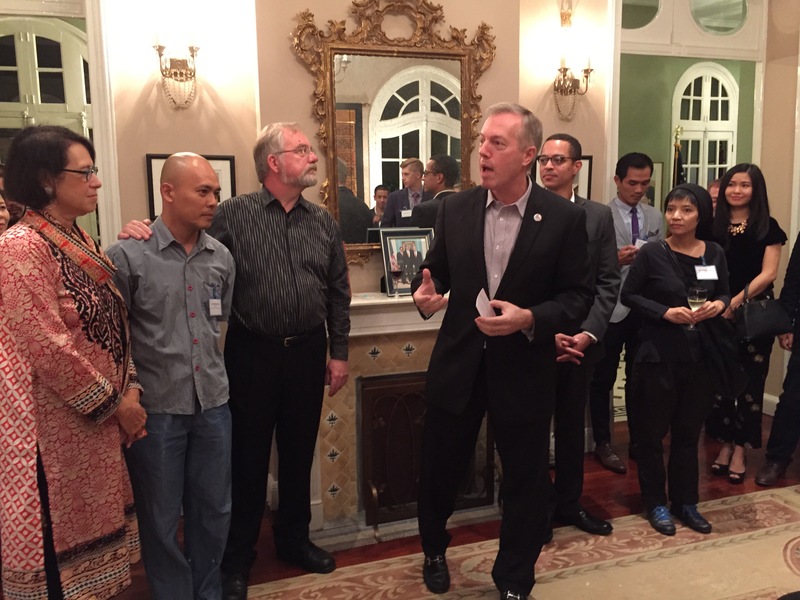 And talking of door openers, there indeed were a lot of meet and greets and hellos and “let’s have dinner next time you’re here” as the Ambassador’s idea to provide the Hà Nội New Music Ensemble with an entry card to the contacts of the United States in Việt Nam was very tangible. Here are a few examples. Ivan Baygushev and Nikolai Konstantinov of the Vietnam Russia JV Bank hit it off with Jan. Dinner is on the books next trip to Hà Nội! 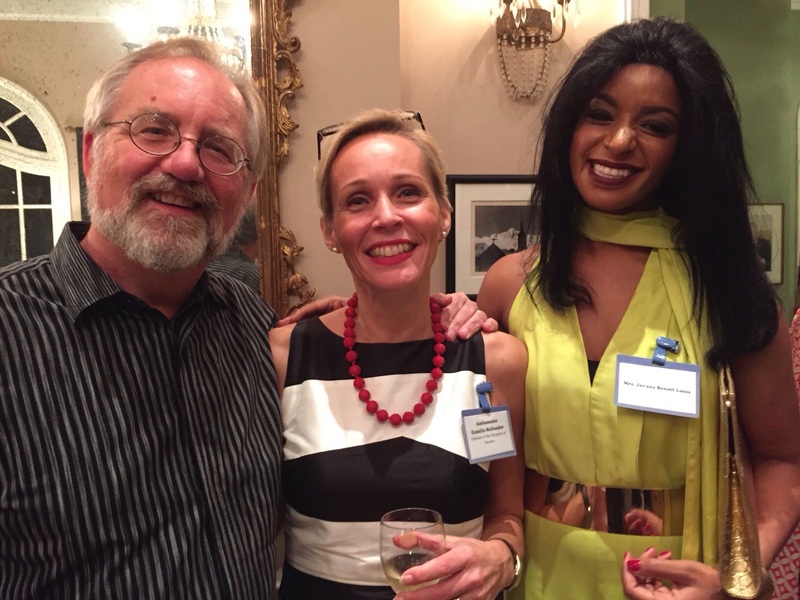 American photographer Larry D’Atillio with Pam Foard and Mr. and Mrs. Perkins from the UK. A good example of opening doors as I meet the Ambassadors of Sweden and Haiti. After a lot of good California wine (Bogle and Ravenswood) in a great atmosphere, things tend to get a little goofy and, simultaneously, a little stunning (as in”this is really happening, isn’t it?”, a common refrain from members of my group that night). Since I’ve a full inbox of emails with the thoughts and plots of next steps, there’s no problem predicting a bright future for us together in Hanoi. 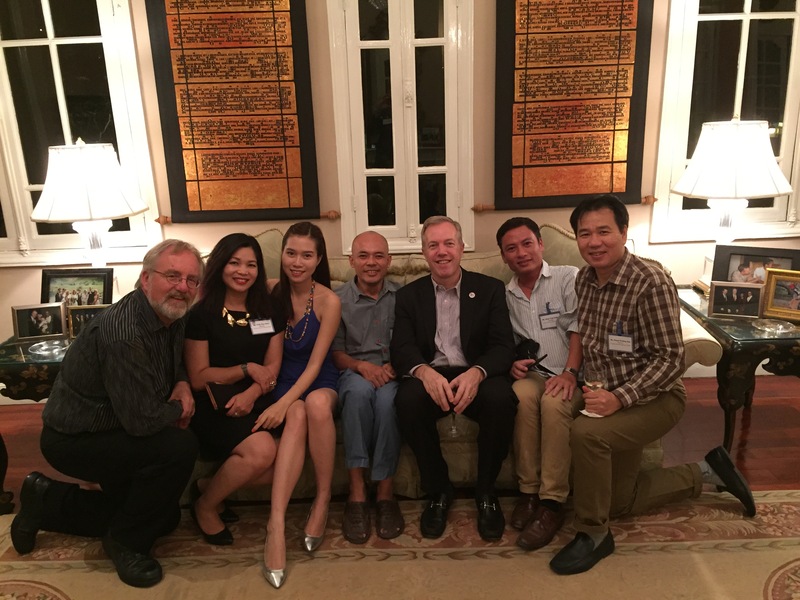 I thought sharing a few of those photos would be enjoyable, especially for my readership in Việt Nam! Photo of a selfie in progress! 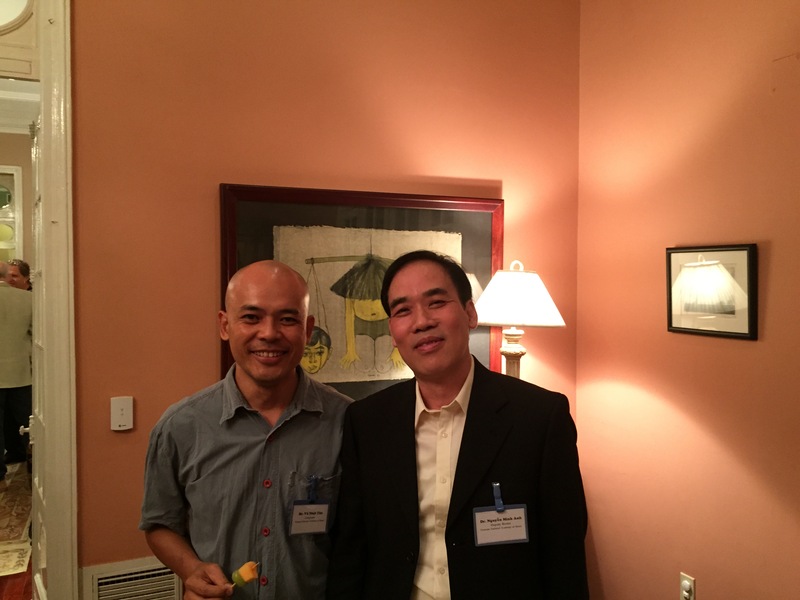 With the HNME “Philosopher” Quốc Bảo. Jan quietly savoring the moment with Trần Thu Thủy and Vũ Nhật Tân. Smiles, and photos, need no translation! Like all parties, the energy starts to wane towards the end. There’s a Jewish saying that you hear the truth when you say goodbye, and the lingering for this party was particularly touching. And so Ambassador Ted understood his role representing all of us in America to the Vietnamese. 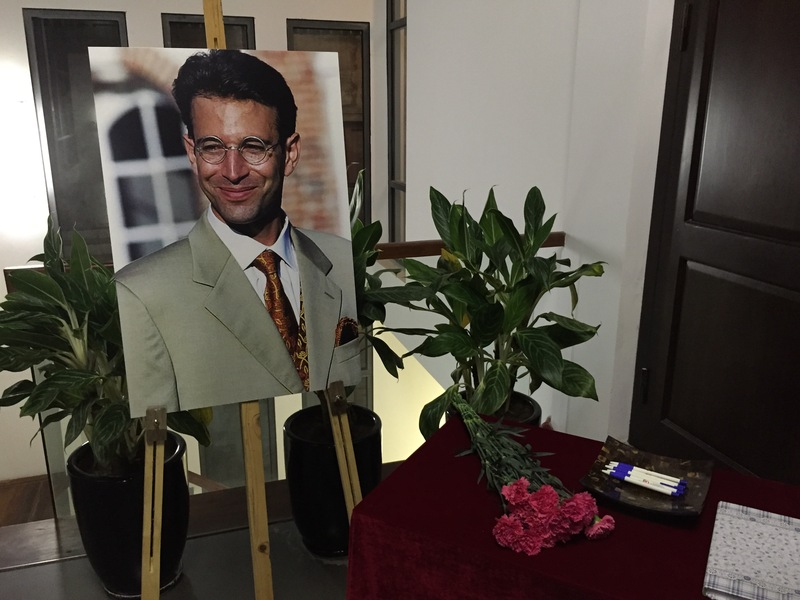 He offered to continue to talk to people, about a wide variety of topics, providing everybody with the confidence that this wonderful moment was not a flash in the pan, and that numerous next steps had already been initiated by the contacts and ideas shared during the reception. How America turns the page in Việt Nam! Finally we took one last look into a camera before leaving the Ambassador and Clayton free to put their darling two youngsters to sleep. 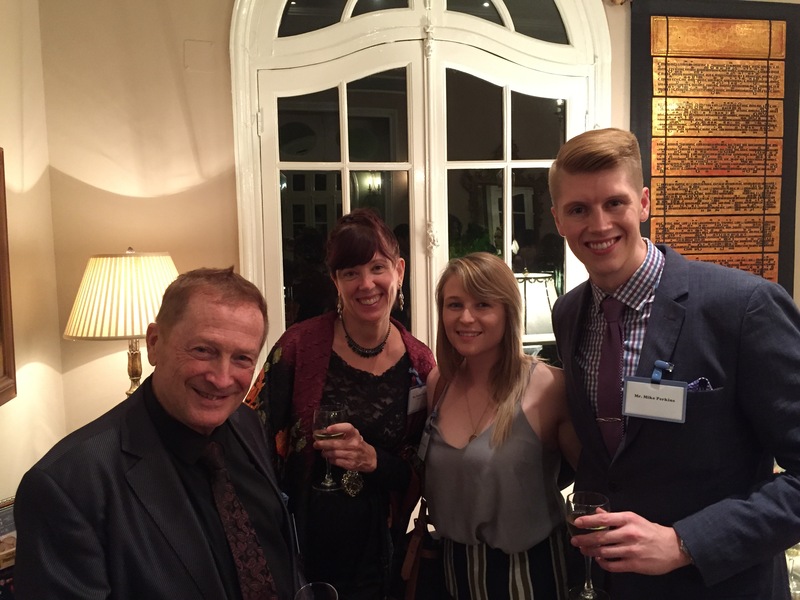 Jan and I were honored to meet their family quietly upstairs, away from the party, which gave us a good chance to converse with Ambassador Osius and Clayton. We discussed Indonesia, ASEAN issues, the Trans Pacific Partnership Treaty, Asia in general and of course our next steps in Vietnam, which are developing as I’m writing. It was a helpful moment. That’s a good thing for me to remember about Ambassador Osius. But back to the last photo of the night. A camera doesn’t lie, and I can see a deep satisfaction in everybody’s face. On to the Next Chapter in 2016! A wonderful evening in Hà Nội. 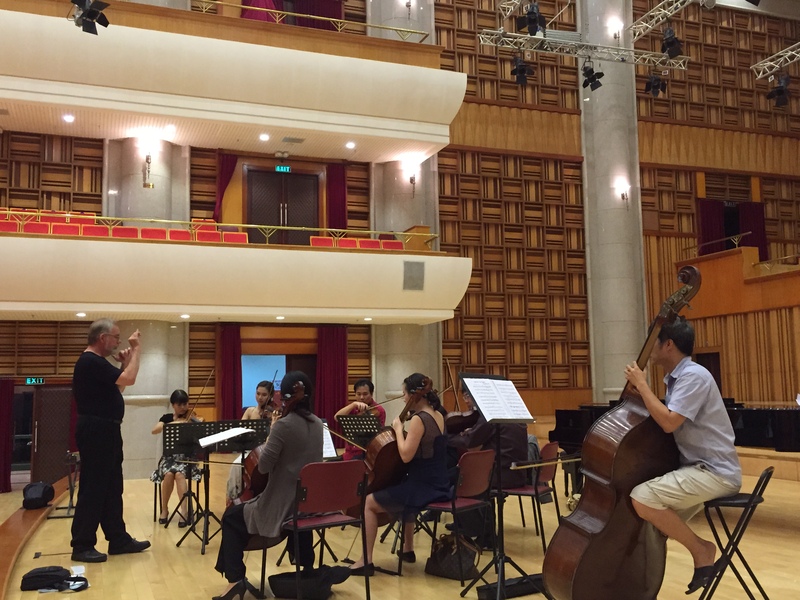 My next blog about Việt Nam will include a report on our final concert in the new Grand Hall of the Việt Nam National Academy of Music. And an incredible party, with a Vietnamese dish you won’t want to miss, No Way Out Chicken. Stay connected!